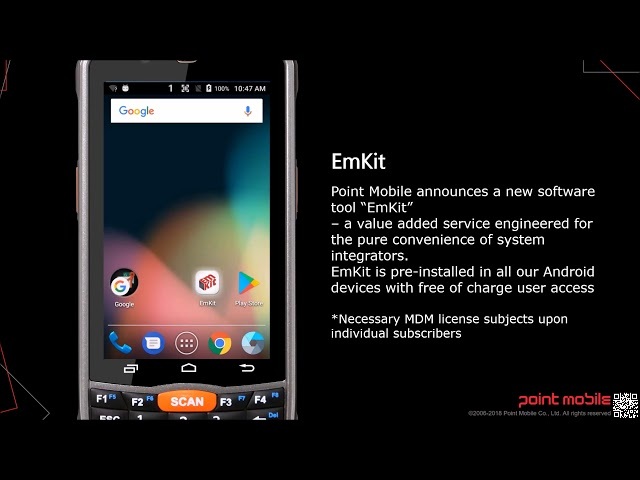 The new Point Mobile PM45 is a 5 '' mobile smartphone. Based on the latest technology, combined with superior mobility and a robust industrial design. The powerful Qualcomm 8 core processor offers high-quality 4G LTE, GPS wireless communication, Bluetooth 4.2 and NFC & PTT. The PM45 is also equipped with the brand new 7.1 version of Android for maximum productivity in business applications. The new flagship of Point Mobile is seen as one of the most rugged smartphones in his class, with an IP67 dust and water protection and a fall resistance of 1.2 meters. That makes the PM45 ideal for use in extreme environments. The PM45 is available with a competible vehicle- and bureau cradle to charge the device fast and sustainable. This is a ideal alternative for the basic USB type C-charge method. Another key benefit is that the PM45, together with all other Point Mobile products, will have a long product-availability for at least 4-5 years, with optional service up till 4 years after the device is EOL (End Of Life). 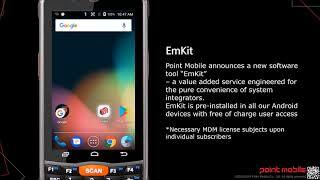 - Pre-installed device agent for quick integration and connection with various MDM (Mobile Device Management) solutions, such as SOTI MobiControl & Teamviewer. - Power launcher: Kiosk Mode with system restrictions for users. - Scan2set: Deployment functionality to quickly configurate the device. - Direct clone: ​​Copy settings, applications and configurations quickly and transfer them to other devices. There is also an option to purchase a Service Contract with your PM45 at Go4Mobility. This Service Contract gives full coverage over unforeseen repair costs. For more information about the Service Contracts, please contact us by phone or E-mail. The Point Mobile PM45 is now available from stock at Go4Mobility!